These unique numbered markers have two hinged 6 cm scale attachments. The attachments allow the scales to be configured into several positions including an L shaped scale. With both attachments closed, the marker measures 6cm. With one attachment extended, the scale measures 12 cm. With both attachments extended straight across, the scale measures 18 cm. Either of the attachments can be folded down to create an L shaped scale. 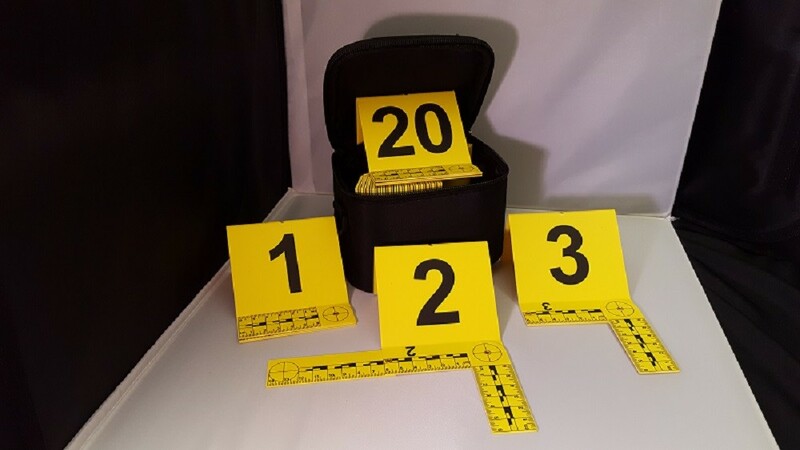 The tent markers measure 3” x 3.5”, are yellow with black graphics for the numbers and scales, and have a hole in the top for flag placement. The markers are numbered 1-20, nest together, and can be purchased with or without the convenient carry bag.